In preparation for their Confirmation, St. Magdalen’s 8th grade CCD students participated in the “Project Hope House” food drive. 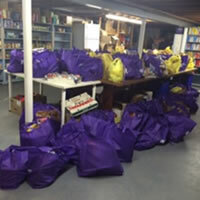 All throughout Lent students brought purple bags filled with groceries to deposit in our parish’s food bank and social hub ministry, Hope House. During their Confirmation retreat, students were given a tour of Hope House and helped to sort and stock shelves. It is our hope that this stewardship effort will bear much good fruit for all.